Ignasi Gómez-Sebastià; Alvarez-Napagao, Sergio; Garcia-Gasulla, D.; Cortes, U.
Assistive Technologies (AT) are an application area where several Artificial Intelligence techniques and tools have been successfully applied to support elder or impeded people on their daily activities. However, approaches to AT tend to center in the user-tool interaction, neglecting the user's connection with its social environment (such as care-takers, relatives and health professionals) and the possibility to monitor undesired behaviour providing both adaptation to a dynamic environment and early response to potentially dangerous situations. In previous work we have presented Coaalas, an intelligent social and norm-aware device for elder people that is able to autonomously organize, reorganize and interact with the different actors involved in elder-care, either human actors or other devices. In this paper we put our work into context, by first examining what are the desirable properties of such a system, analysing the state of the art on the relevant topics, and verifying the validity of our proposal. Assistive Technologies (AT) are an application area where several Artificial Intelligence techniques and tools have been successfully applied to support elder or impeded people on their daily activities. However, approaches to AT tend to center in the user-tool interaction, neglecting the user's connection with its social environment (such as care-takers, relatives and health professionals) and the possibility to monitor undesired behaviour providing both adaptation to a dynamic environment and early response to potentially dangerous situations. In previous work we have presented Coaalas, an intelligent social and norm-aware device for elder people that is able to autonomously organize, reorganize and interact with the different actors involved in elder-care, either human actors or other devices. In this paper we put our work into context, by first examining what are the desirable properties of such a system, analysing the state of the art on the relevant topics, and verifying the validity of our proposal. Gómez, I. [et al.]. 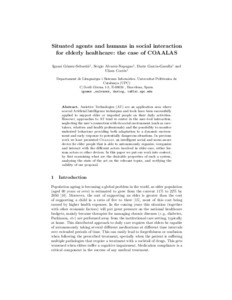 Situated agents and humans in social interaction for elderly healthcare: the case of COAALAS. A: Conference on Artificial Intelligence in Medicine. "Proceedings of the VIII workshop on Agents Applied in Health Care". Murcia: 2013, p. 105-119.